US oil production continues to increase. The 8.97 million barrels per day of crude oil is higher than the peak in the 1980s of 8.969 million barrels per day in 1985. So all weekly numbers back to the beginning of 1983 have been passed. Oil production was lower from 1974 to 1982. So the new peak is the highest since 1973. In 1973 Nixon was president. The USA had not finished the Vietnam war (which ended in 1975). 1973 is 41 years ago. In 1973, Secretariat won the Kentucky Derby. Marlon Brando won best actor for the Godfather. In 1973, Bruce Lee had a mysterious death. Gasoline was about 60 cents per gallon in 1974 and 30 cents in early 1973. Adjusting for inflation, the most a barrel of oil cost during the 1973 oil crisis was about $115. Oil is now $80-85 per barrel depending upon whether it is West Texas Intermediate or Brent. The combined crude oil and natural gas liquids production is over 12 million barrels per day. The all oil liquids (including ethanol and refinery gains) is over 14 million barrels per day. disaster in the Gulf of Mexico. According to a report in the Proceedings of the National Academy of Sciences, a portion of the 2 million barrels of oil thought to be trapped in the deep sea after the spill appears to have settled across a 1,250-square-mile patch of the seafloor centered around the Macondo Well, which discharged an estimated 5 million barrels of oil in the nearly three months between its blowout in April and eventual capping in July. The oil is concentrated in the top half-inch of the seafloor, and mostly distributed in patchy deposits to the southwest of the well, the study found. These deposits account for between 4 and 31 percent of the Macondo oil sequestered in the deep ocean, researchers estimate. The rest has likely been deposited outside this area, they say, but has evaded detection so far because of its patchiness. Wood MacKenzie forecasts that the US will have achieved energy independence goal by 2025, marking the first time since 1952 that the country will export more energy than it imports. if the crude export ban is lifted then it is likely that energy independence will be attained before 2025. The move would increase the price realized by domestic upstream producers as they would be able to access higher priced international markets. Receiving an additional US$5 per barrel could result in a production increase of 350-400,000 barrels per day. 2. US vehicle fleet is forecast to become 40% more efficient by 2030. Any further vehicle efficiency improvement would reduce US oil demand and, consequently, net oil imports. In response to the 2014 falling fatalities OSHA has implemented a national outreach campaign using traditional, digital and social media, including a tower safety webpage. OSHA framed the campaign with the slogan, "No More Falling Workers." OSHA is also preparing a Request for Information to engage all stakeholders "in a collaborative effort to prevent more of these senseless tragedies." Additionally, OSHA has set up a dedicated email address, at OSHACommTower@dol.gov, where individuals may "share your stories, concerns, and best practices." Employers in the communications tower industry need to be especially cognizant of OSHA's rampant attention to their business and projects. Special care should be taken to make sure that all of your company safety policies, procedures, and training are up-to-date and current. While accidents may happen no matter how well we work to avoid them, having corporate materials in order, and properly training and overseeing your employees will go a long way in minimizing potential liabilities if and when an accident occurs. A brisk building boom of hydropower mega-dams is underway from China to Brazil. Whether benefits of new dams will outweigh costs remains unresolved despite contentious debates. We investigate this question with the "outside view" or "reference class forecasting" based on literature on decision-making under uncertainty in psychology. We find overwhelming evidence that budgets are systematically biased below actual costs of large hydropower dams — excluding inflation, substantial debt servicing, environmental, and social costs. Using the largest and most reliable reference data of its kind and multilevel statistical techniques applied to large dams for the first time, we were successful in fitting parsimonious models to predict cost and schedule overruns. The outside view suggests that in most countries large hydropower dams will be too costly in absolute terms and take too long to build to deliver a positive risk-adjusted return unless suitable risk management measures outlined in this paper can be affordably provided. Policymakers, particularly in developing countries, are advised to prefer agile energy alternatives that can be built over shorter time horizons to energy megaprojects. Slashdot medical researchers from Harvard Medical School and Massachusetts General Hospital have successfully cultivated stem cells that will kill brain cancer cells in mice without damaging healthy cells. "They used genetic engineering to make stem cells that spewed out cancer-killing toxins, but, crucially, were also able to resist the effects of the poison they were producing. ... In animal tests, the stem cells were surrounded in gel and placed at the site of the brain tumor after it had been removed. Their cancer cells then died as they had no defense against the toxins (abstract)." The next step in the research is to try the treatment on humans. Chris Mason, a professor of regenerative medicine, said, "This is a clever study, which signals the beginning of the next wave of therapies. It shows you can attack solid tumors by putting mini pharmacies inside the patient which deliver the toxic payload direct to the tumor. Cells can do so much. This is the way the future is going to be." Read more of this story at Slashdot. At least 25,000 people evacuated after the Fukushima nuclear accident in Japan will never be able to go home. A large swathe of land downwind of the four Fukushima Daiichi reactors smashed by a 15-metre tsunami in March 2011 is so contaminated by radioactivity that it will not be officially safe to return for more than 100 years. Tens of thousands more who have left their homes outside the most contaminated zone will choose never to return because of the dangers. One is Rumyko Kobayashi, a quietly spoken grandmother of nine, who had to leave her ancestral home in Tomioka. "Because the radiation is so high, I can't bring my grandchildren home and I do not want to live in a place where you can't see your grandchildren," she said. With heart-rending dignity, Kobayashi confesses how strongly she feels about what she's lost. "I am very, very sorry to my ancestors who lived there for a long time as a family, a chain of generations," she said. "I am very sorry to my children and grandchildren because they cannot come back to live in our cherished home. I feel guilty, as if it was me who blew up the nuclear power station." The explosions, meltdowns and leaks at Fukushima Daiichi triggered by an earthquake and tsunami three and a half years ago have hurt Japan deeply, triggering 2.2 million compensation claims, an £8 billion decontamination budget and dozens of legal suits. It's a hurt that is going to take many decades to heal. More than 30,000 square kilometres of northern Japan were contaminated by the huge clouds of radioactivity that belched into the air during the accident. More than 80,000 people were forced to evacuate from the areas closest to Fukushima Daiichi, and at least another 80,000 are reckoned to have voluntarily decided to flee their homes. The official evacuation zone is divided into three different areas. In the least contaminated, furthest away from the nuclear plant, the Japanese government is hoping to allow 32,900 people to return soon. In the second area there is twice or three times as much contamination, and no immediate plan to lift the ban on living there. But the government is hoping that, after decontamination work and natural radioactive decay, 23,300 people will be allowed home in years to come. In the third area closest to the nuclear station, radiation levels are so high that experts say it will be more than 120 years before it will be safe for anyone to be allowed back. That means that the 24,700 who used to live there will all be dead before they can go home. Many of those who may be allowed back won't want to come. A survey of one village in the evacuation zones, Katsurao, found that 60 per cent of residents either didn't want to return home or weren't sure. Families with young children faced an "enormous challenge" because of the "invisible risk" of radiation, said the village mayor, Masahide Matsumoto. "At least 25,000 people will never be able to return home, and this will have traumatic, prolonged and widespread consequences," said Maria Vitagliano, international programme director for Green Cross International, an environmental Red Cross active in Japan and set up by former Soviet president Mikhail Gorbachev in 1993. She added: "In Japan the catastrophe is continuing. Three years on, it is impossible to calculate the full dimensions of this disaster and its terrible consequences for the people. This is a catastrophe that will cause untold suffering for decades to come." More than 1,600 deaths have been attributed to the nuclear accident by the Japanese authorities, mainly amongst elderly evacuees due to acute stress, suicides or shortages of medical care. Any long-term health damage from the radioactive contamination will take many years to show up. It is a tragic disaster that is getting worse, according to Ikuko Hebiishi, a green councillor in Koriyama city, 34 miles from Fukushima Daiichi. The evacuations have torn families and communities apart, making people sick and depressed, she said. "The next Fukushima disaster could happen anywhere and anytime in Japan as long as nuclear power plants exist in our country. The co-existence of nuclear power and human beings is totally impossible." The way U.S. cities move around natural gas may be contributing more to climate change than anyone appreciated: The pipes are leaking, and some are leaking a lot. About a third of the natural gas we consume is delivered to homes and businesses, where it fires appliances like furnaces, boilers, ovens and cooking stoves. To transport this gas, most urban areas have extensive networks of underground pipelines, many of which were built decades ago. Although big leaks are hard to miss (they smell), small leaks can go undetected. How much natural gas leaks out before it gets to the furnace in your basement? Until recently, no one had thought much about this. But one research group has pioneered the study of urban gas leaks by driving around cities, first Boston and then Washington, D.C., with equipment that can sniff out natural gas leaking from pipelines. The researchers found plenty of leaks: more than 3,000 individual leaks in Boston and nearly 6,000 leaks in D.C. Although few were concentrated enough to be an explosion risk, all leaks warm the climate; natural gas is mostly methane, which has a stronger climate-warming effect than carbon dioxide in the short term, as I discussed in a recent article. You might think that the public utilities supplying the gas would have an economic incentive to reduce leaks and avoid losing a valuable product, but the reality is the opposite. Every utility knows how much gas is being lost; it’s simply the difference between the amount of gas the utility purchases as the gas enters the city and the amount of gas the utility sells to its customers. But the cost of the lost gas is typically charged to the utility’s customers: Each of us pays a little bit on our gas bill to purchase gas that leaks into the atmosphere. Plugging the leaks would be no small feat — urban gas pipelines across the country are decades old, and are just one of many items on America’s lengthy to-do list of repairs to aging infrastructure. As Andrew Flowers has reported on this site, we can’t afford all of these repairs in the current political and budgetary climate. The results of the Boston study hint at one way to prioritize efforts to repair leaky urban gas pipeline systems. The Boston neighborhoods with the most gas leaks were also those with the most pipes made of cast iron, which is older and more prone to rust than newer pipeline materials. This suggests that cities with more cast-iron pipes are probably leaking more gas. Replacing these leaky cast-iron pipes would have multiple benefits: Reduced climate effects, increased safety and cost savings for customers. But that last statement highlights the crux of the problem: The customers are the ones currently paying for lost gas — we’re buying it, essentially. In fact, if a municipal utility reduced pipeline leakage, it would actually lose money because it would sell less gas overall. Clearly these economic incentives are backwards, and one solution is for state governments to implement programs to change them. New Hampshire, for instance, has had cast-iron replacement programs in place since 1996. MADISON -- Wisconsin's use of surface and groundwater declined 6 percent in 2013 from prior year levels as cooler temperatures and a return to normal rainfall patterns reduced demand for power plant cooling water, municipal drinking water and irrigation. banned in the European Union does not increase soybean yields compared to using no pesticides at all, according to an extensive review by the the U.S. Environmental Protection Agency (EPA). Seed treatment provides at most $6 in benefits per acre (an increase in revenue of less than 2 percent), and most likely no financial benefit at all, the EPA analysis concluded. The insecticides, known as neonicotinoids, are only effective for the first few weeks after planting, studies have found, when soybean pests are not typically active. Neonicotinoid seed treatments could theoretically help fend off sporadic and unpredictable pests, the report notes, but that benefit would be small and unlikely to be noticed outside of the southern U.S.
Slashdot; Those free soft drinks at your last start-up may come with a huge hidden price tag. The Toronto Sun reports that researchers at the University of California — San Francisco found study participants who drank pop daily had shorter telomeres — the protective units of DNA that cap the ends of chromosomes in cells — in white blood cells. Short telomeres have been associated with chronic aging diseases such as heart disease, diabetes and some forms of cancer. The researchers calculated daily consumption of a 20-ounce pop is associated with 4.6 years of additional biological aging. The effect on telomere length is comparable to that of smoking, they said. "This finding held regardless of age, race, income and education level," researcher Elissa Epel said in a press release. The 132 passengers who flew with Amber Joy Vinson from Cleveland to Dallas onboard a Frontier Airlines flight on October 13 may have been exposed to the Ebola virus. The Centers for Disease Control and Prevention (CDC) has been reaching out to all 132 passengers of Flight 1143 that flew with Vinson as part of the agency's "extra margins of safety," reports CNN. zero hedge - With 80% of Americans concerned about Ebola, and Europe's most worrisome 'factor' is rising prices (yes, rising, despite central banks' deflation ogre fears), we thought it might be useful to remember just what other concerns the world has. From 'inequality' to 'religious hatred' and from 'nuclear weapons' to 'pollution', there is a lot of diverse fears around the world. Americans are focused on Ebola (for now)...nearly 80 percent were concerned about the Ebola outbreak, with 41 percent saying they were "very concerned" and 36 percent "somewhat concerned." Europe's biggest fears - rising prices! So, paradoxically to "fix" Europe, Mario Draghi is desperately trying to make Europe's biggest problem even worse. As panic over the spread of Ebola persists, a new report from the Pew Global Attitudes Project offers a bit of perspective. It explores the larger threats people in different regions of the world fear. Unsurprisingly, concerns vary across continents. Respondents to the poll were asked to cite what they believed was the top global threat out of five categories. The 48,643 respondents came from 44 countries. CBS » Why No Protective Gear For Man With Dallas Ebola Patient? CBS: As the world watched the loading of Ebola patient Amber Joy Vinson onto a CDC plane Wednesday, something seemed odd to us, and a lot of you as well. On social media, and on the CBS 11 News phone lines, the biggest question became – who was the guy not wearing protective hazmat gear? CBS 11 News did some digging and got answers. A news crew spoke with a number of different agencies that were involved in Vinson's transport. Officials with AMR, the ambulance company that transported Vinson from Texas Health Presbyterian Dallas to Dallas Love Field Airport, said it wasn't one of their guys. From the CBS 11 Chopper video (seen at the top of this post) it looks like the man left with Vinson on the plane. A spokesperson with Emory University Hospital in Atlanta said that, to her knowledge, none of their people were on the plane. That pretty much leaves a worker from the Centers for Disease Control and Prevention. Sustainablog; According to the EPA, Americans dump over 36 million tons of food waste every year. Not only is that horrendously wasteful in a world where billions of people are starving, but decomposing food also creates methane, which is ten times more harmful as a greenhouse gas than carbon dioxide. In Boston, Andy Brooks, a former journalist, started a business in 2011 picking up food waste from local restaurants using a bicycle. Now his business has eight employees and three trucks and gathers organic waste from 750 homes and 50 businesses. Residential service costs $8 a week. Commercial accounts start at $18 a week. "I realized pretty quickly that there was a pretty big demand for this," Brooks says. In Philadelphia, Tim Bennett started Bennett Compost. He and his crew service more than 1,000 homes and 15 to 20 small businesses, hauling their food scraps and yard waste to five different farms for composting. CompostNow in Raleigh, North Carolina has 350 residential customers. In Washington DC, Compost Cab counts about 500 homes and a few dozen businesses as clients. "What we're really talking about is building a more sustainable citizenry, one bag of food scraps at a time," Compost Cab founder Jeremy Brosowsky says. However, a growing number of communities are planning citywide or regional organics recycling programs. They are already up and running in hundreds of communities, especially large West Coast cities and their suburbs says Jerry Powell, executive editor of Resource Recycling magazine. He says one-man-and-a-truck operations can't handle large scale operations. Powell believes municipalities can do it cheaper and more efficiently by doing it themselves or contracting with large commercial haulers. "At which point our business goes away," said CompostNow founder Justin Senkbeil. "So this model, nationwide, is probably a 10 to 15 year business model." In Milwaukee, Melissa Tashjian isn't worried. She sees plenty of near-term potential. "One thing there is not a lack thereof is waste," she said. "It happens every day, all year. It doesn't matter what the weather's like. It doesn't stop." The post Composting For Entrepreneurs appeared first on Sustainablog. CBS News...In the case of Amber Vinson, the Dallas nurse who flew commercially as she was becoming ill with Ebola, one health official said "somebody dropped the ball." Medical Research Org CIDRAP: Ebola Transmittable by Air? BREITBART; The highly respected Center for Infectious Disease Research and Policy (CIDRAP) at the University of Minnesota just advised the U.S. Centers for Disease Control (CDC) and World Health Organization (WHO) that “there is scientific and epidemiologic evidence that Ebola virus has the potential to be transmitted via infectious aerosol particles,” including exhaled breath. In December 1991, OSHA promulgated a standard entitled "Occupational Exposure to Bloodborne Pathogens" to eliminate or minimize occupational exposure to bloodborne pathogens 214. One component of this requirement is that all equipment and environmental and working surfaces be cleaned and decontaminated with an appropriate disinfectant after contact with blood or other potentially infectious materials. Even though the OSHA standard does not specify the type of disinfectant or procedure, the OSHA original compliance document 269 suggested that a germicide must be tuberculocidal to kill the HBV. To follow the OSHA compliance document a tuberculocidal disinfectant (e.g., phenolic, and chlorine) would be needed to clean a blood spill. However, in February 1997, OSHA amended its policy and stated that EPA-registered disinfectants labeled as effective against HIV and HBV would be considered as appropriate disinfectants ". . . provided such surfaces have not become contaminated with agent(s) or volumes of or concentrations of agent(s) for which higher level disinfection is recommended." When bloodborne pathogens other than HBV or HIV are of concern, OSHA continues to require use of EPA-registered tuberculocidal disinfectants or hypochlorite solution (diluted 1:10 or 1:100 with water) 215, 228. Studies demonstrate that, in the presence of large blood spills, a 1:10 final dilution of EPA-registered hypochlorite solution initially should be used to inactivate bloodborne viruses 63, 235 to minimize risk for infection to health-care personnel from percutaneous injury during cleanup. Using proper surface disinfection can prevent infections that develop during hospitalization that are neither present nor incubating at the time of a patient's admission. There are important factors to consider when selecting a surface disinfectant. This paper discusses a comparison of the product types on the basis of the health-related issues of infection prevention, compatibility with equipment and gloves, as well as the safety of the disinfectant to hospital personnel. Some ideal characteristics of disinfectants used on environmental surfaces include rapid action in a broad antimicrobial spectrum, maintained efficacy in the presence of protein or blood, low toxicity, user safety, and material compatibility. Some disinfectants have limited use because they do not meet all of these criteria. Table 1 shows a list of 10 disinfectants, the active ingredients, manufacturer, characteristics of the disinfectant, and a recommendation of the types of gloves that can be used with the product for up to one hour. The spectrum refers to the range of recommended product usage and the sphere of microbial kill tested, as well as the contact time and temperature, according to the manufacturer and the EPA-approved label. The 10 products that are mentioned in Table 1 are similar in antimicrobial activity because they all claim to be bactericidal, fungicidal, and virucidal. However, not all disinfectants claim to be tuberculocidal. Envirosafe, Coverage HB, Coverage Spray, and Ascend are all low-level disinfectants and they do not kill the tubercule bacillus (i.e., M. Bovis). Based on the disinfectant class, the range of antimicrobial activity is discussed in further detail below. Lysol I.C. Disinfectant Spray has a broad spectrum of antimicrobial activity with 79% ethyl alcohol and has a recommended surface contact time of 10 minutes. High concentration alcohol products are generally not advocated for instrument immersion since the high alcohol content volatilizes easily, and thus diminishes antimicrobial activity. Additionally, alcohols cannot be used as cleaners, which then requires the user to purchase a separate cleaner. Dispatch can be used as a cleaner due to the presence of added surfactants and a deodorizer. It has a broad range of efficacy with a label claim contact time of two minutes at 20°. Both Babb and Alvarado et al. do not recommend chlorine-based compounds, such as the sodium hypochlorite contained in Dispatch, for disinfection of instruments and equipment. Robison et al. reported that a commercial disinfectant containing 0.55% sodium hypochlorite with a 2-minute contact time at room temperature displayed poor tuberculocidal activity. According to Robison's study, the average time required for a 6-log10 reduction was in excess of three hours. However, the CDC recommends that 5.25% sodium hypochlorite (household bleach) diluted to a concentration of 0.05% can be used for the decontamination of a blood spill. Wex-cide, ProSpray, and Birex are germicidal, fungicidal, virucidal, and tuberculocidal in 10 minutes at 20°. Birex is a cleaner and deodorizer. Birex is not sold at the use-dilution, and therefore, diluting Birex involves an extra step. Surface disinfectants that require dilution can result in preparation errors, and incomplete disinfection due to an inappropriate disinfectant concentration. Envirosafe, Coverage HB, Coverage Spray, and Ascend are all low-level quaternary amine-based disinfectants, and have a more prominently restricted efficacy range than the other products discussed herein. These product spectrums do not include tuberculocidal activity. With the exception of Coverage HB concentrate, they do not kill HBV (Hepatitis B Virus). Additionally, Envirosafe, Coverage HB, and Ascend are not sold at the optimum concentration and dilution is required. Envirosafe, Coverage HB, Coverage Spray, and Ascend can be used for ultrasonic cleaning and as general cleaners. The four quaternary amine products can also be used for (limited) instrument immersion for the allotted time to kill microorganisms. However, surface disinfectants in general are not recommended as permanent holding solutions. The synergistic mechanism of quaternary amines in the presence of alcohols involves the breakdown of the lipoprotein complexes by the quaternary amines in the cell membrane of microorganisms. The opening of the membrane thereby allows the alcohol, which is a protein denaturant, to penetrate the cell membrane and cause irreversible damage inside the cell. Cavicide has a broad spectrum of antimicrobial activity with a recommended surface contact time of 10 minutes at 20°. It can be used as a cleaner, as an ultrasonic cleaning solution, and for instrument immersion. Including blood in all active ingredient efficacy testing is important because clinicians rarely deal with pure cultures of microorganisms. Clinically, microorganisms are usually contained within proteinaceous material such as blood, plaque, saliva, etc. Inclusion of these proteins in tests is important since these proteins interfere with the antimicrobial activity of disinfectants. For this reason, it is a good clinical practice--and a mandated labeling requirement from the EPA--to clean surfaces of gross debris prior to disinfection. Peak Energy: RNE has a look at the global solar power market - Total global solar heads for 200GW, 50GW in 2014. Through a fifty-five page proposed rule in the form of a Request for Information (RFI), 79 Fed. Reg. 61384 (October 10, 2014), OSHA has re-opened a "national dialogue on hazardous chemical exposures and permissible exposure limits" (PELs) in the workplace. The OSHA's PELs are the regulatory limits on the amount or concentration of a chemical substance in the air in the workplace. The PELs are intended to protect workers against the adverse health effects of exposure to hazardous substances. According to OSHA, approximately ninety-five percent of the current nearly 500 PELs have not been updated since their adoption in 1971. More importantly, OSHA's current PELs cover only a "small fraction of the tens of thousands of chemicals used in commerce, many of which are suspected of being harmful." OSHA had previously acted in 1989 to update the PELS. In a challenge to that rulemaking the Eleventh Circuit Court of Appeals vacated the final rule, finding that "OSHA has not sufficiently explained or supported its threshold determination that exposure to these substances at previous levels posed a significant risk of these material health impairments or that the new standard eliminates or reduces that risk to the extent feasible." AFL-CIO v. OSHA, 965 F. 2d 962 (11th Cir. 1992). In its announcement concerning this rulemaking, Dr. David Michaels, the OSHA Administrator, said "many of our chemical exposure standards are dangerously out of date and do not adequately protect workers." "While we will continue to work on updating our workplace exposure limits, we are asking public health experts, chemical manufacturers, employers, unions and others committed to preventing workplace illnesses to help us identify new approaches to address chemical hazards." Inform the public and obtain public input on the best methods to advance the development and implementation of approaches to reduce or eliminate harmful chemical exposures in the workplace. In a public statement Dr. Michaels stated that "we are particularly interested in ideas about possible streamlined approaches for risk assessment and feasibility analyses, and alternative approaches for managing chemical exposures. Among the approaches we ask about are control banding, task-based approaches, and informed substitution." It is the lack of risk assessments and feasibility analyses that tripped up OSHA in its 1989 PELs rulemaking. OSHA is now seeking a "work-a-round" to enable the massive revision and update to the PELs, without the trouble and expense associated with risk assessments and feasibility analyses for every chemical on the to be expanded list. This rulemaking is important to manufacturers and businesses that make, use, distribute, or handle chemical substances. Public comments on the RFI, Docket No. OSHA-FRDOC-0001-0595, are due on April 8, 2015. Slashdot: According to Scientists at Nanyang Technology University (NTU), they have developed ultra-fast charging batteries that can be recharged up to 70 per cent in only two minutes and have a 20-year lifespan (10,000 charges). The impact of this is potentially a game changer for a lot of industries reliant on lithium ion batteries. In the car industry, for example, consumers would save on costs for battery replacement and manufacturers would save on material construction (the researchers are using a nanotube structure of Titanium dioxide, which is an abundant, cheap, and safe material found in soil). Titanium dioxide is commonly used as a food additive or in sunscreen lotions to absorb harmful ultraviolet rays. It is believed that charging an electric car can be done in as little as 5 minutes, making it comparable to filling up a tank of gasoline. MOTHER EARTH NEWS...The microscopic organisms that produce biogas, known as Archaea, are among the oldest life forms on Earth. They predate the planet's oxygen atmosphere — much less oxygen-breathing and CO2-absorbing plant life — by a cool 3.5 billion years. That's billion with a "B." Archaea are not bacteria, they are genetically closer to humans and other animals (eukaryotes), and form their own animal kingdom. As the Earth's atmosphere became predominantly oxygen about 500 million years ago, archaea became isolated in the few remaining airless places, such as stagnant swamps, deep oceans, caves and hot springs, and of course the stomachs of vertebrates. To create biogas, we must recreate the conditions in which Archaea thrive in nature. The following table outlines the five steps to creating flammable biogas and I will get into further detail with each one. Biogas is reproduced in a special airtight tank called an anaerobic digester. The design of the anaerobic digester determines the first three steps. Step 1. Airtight Environment. A Ziploc baggie can be used for an anaerobic digester. The difficulty arises from trying to add fresh material without allowing oxygen into the system. The most common method of creating a continuous flow digester is the "teapot" or "P-trap" shape. Most biogas digesters are some variation of this teapot shape. Step 2. Archaea love water. When loading a digester, the water content in the material put in it should be taken into consideration. A head of lettuce, for example, looks very solid to us, however, it is 98% water. Dried rice is only 14% water. Regardless of the size of your digester, the "40-50-10 Rule" is simple rule of thumb to follow to get the correct volume: Forty percent material, fill the rest of the digester with water except for 10% headspace. Step 3. A good analogy to think about regarding temperature and anaerobic digestion is your temperature is like the gas pedal of your car. The more you step on it, the faster your digester will convert waste into gas. However, also just like stepping on the gas pedal, there are consequences for it. The warmer your digester is, the archaea that decompose your waste get more fragile and susceptible to an unexpected crash. Temperature can be controlled a few different ways. In China, digesters are typically buried underground and built much larger than they need to be. This way they can be overloaded in winter months to maintain consistent gas production. Other designs employ a greenhouses or hoop house over them. More advanced systems integrate some kind of heat exchanger, which can be heated with solar collectors. Regardless of your design, avoid using biogas or any other fuel to heat your digester. Make sure energy you use is excess energy on its way to being wasted. Step 4. Neutral pH is an important parameter in anaerobic digestion, just as it is for aerobic composting. If pH is measured at the inlet, it will be slightly lower than neutral — usually around 5.5 — as fresh material is converted into acids. The pH will neutralize as these acids are converted into methane gas. By the time the liquid biofertilizer comes out the digester, it should be 7. If the pH of the biofertilizer is lower than this, it is an indicator the digester has been over-fed and is at risk to "sour," or stop working due to low pH. If the pH at the inlet goes below 5.5, it is necessary to add some wood ashes or lime to buffer the digester. A soured digester has no bubble activity and instead of producing gas, instead it draws air into it. The top will be sucked in tightly against the surface of the liquid and if a brewer's airlock is being used, the water in the airlock will be sucked into the digester. Restarting a soured digester is time consuming, and in most cases it is simpler to dump it out and start over. Step 5. Biogas production is best at the same 25:1 C:N ratio as aerobic composting. The reason cattle manure is far and away the most common feedstock for biogas is cattle manure is naturally the perfect 25:1 carbon-to-nitrogen ratio. Cattle manure makes an excellent feedstock to begin experimenting with biogas with. Other wastes need to be combined as a compost pile is. After these five steps, it is important to know that for the first 48 hours for a small digester or up to a couple of weeks for a larger system, the digester will only produce carbon dioxide (CO2). Carbon dioxide is of course used in fire extinguishers. When you put a match to the gas to test for flammability, it will be blown out with an audible "hiss" and a wisp of black smoke. As the biogas begins to come on, the hiss and black smoke will be gone and you will smell the distinct "rotten eggs" scent of the hydrogen sulfide (H2S). This odor is the signal to begin capturing your gas, as it is either flammable or soon will be. This "CO2 Phase" has caused many people to abandon DIY projects that might have been flammable if they had waited a short time longer. 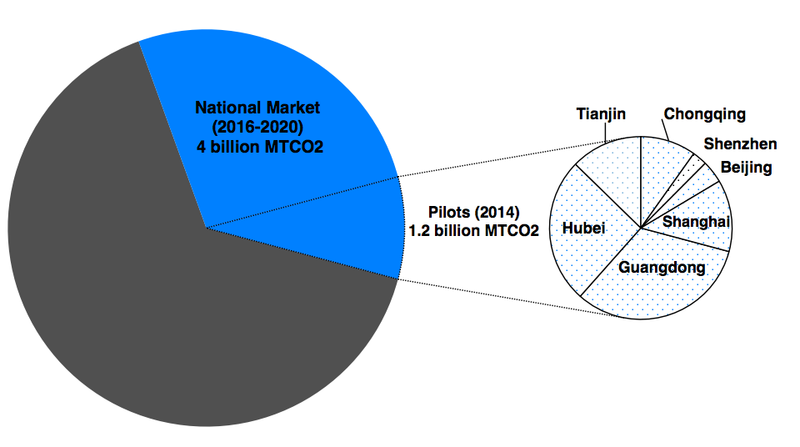 Next Big Future: China's National Development and Reform Commission (NDRC) is talking about prospective national carbon market formation by 2016, with potential coverage upwards of 4 billion MTCO2. According to official NDRC estimates, a national carbon market in China could reach an aggregate value of $65 billion by 2020. In March 2016, China is expected to announce its next five year energy plan. The fundamental levels of China's coal consumption will continue along absolute increases, China's National Energy Administration (NEA) Planning Board Division nonetheless recommended that the 13th Five Year Plan contain a 60% coal consumption target by 2020—a sizable decrease from 67% in 2013. Slashdot: Experimental research has shown that small amounts of estrogen in waste water can lead to rapid large-scale changes in fish populations. From the article: "The lead researcher of a new study is calling for improvements to some of Canada's waste water treatment facilities after finding that introducing the birth control pill in waterways created a chain reaction in a lake ecosystem that nearly wiped out a freshwater fish. 'Right away, the male fish started to respond to the estrogen exposure by producing egg yolk proteins and shortly after that they started to develop eggs,' she said in an interview from Saint John, N.B. 'They were being feminized.' Kidd said shortly after introducing the estrogen, the number of fathead minnow crashed, reducing numbers to just one per cent of the population. 'It was really unexpected that they would react so quickly and so dramatically,' she said. 'The crash in the population was very evident and very dramatic and very rapid and related directly to the estrogen addition.'" Estrogen pollution in waterways has been an issue for over a decade now. Slashdot: Rising sea levels and other effects of climate change will create major problems for America's military, including more and worse natural disasters and food and water shortages that could fuel disputes around the world, Defense Secretary Chuck Hagel said Monday. From the article: "The Pentagon's2014 Climate Change Adaptation Roadmap (PDF) describes how global warming will bring new demands on the military. Among the report's conclusions: Coastal military installations that are vulnerable to flooding will need to be altered; humanitarian assistance missions will be more frequent in the face of more intense natural disasters; weapons and other critical military equipment will need to work under more severe weather conditions. 'This road map shows how we are identifying — with tangible and specific metrics, and using the best available science — the effects of climate change on the department's missions and responsibilities,' Hagel said. 'Drawing on these assessments, we will integrate climate change considerations into our planning, operations, and training.'" Slashdot: A leaked report shows wind is the cheapest energy source in Europe, beating the presumably dirt-cheap coal and gas by a mile. Conventional wisdom holds that clean energy is more expensive than its fossil-fueled counterparts. Yet cost comparisons show that renewable energy sources are often cheaper than their carbon-heavy competition. The report (PDF) demonstrates that if you were to take into account mining, pollution, and adverse health impacts of coal and gas, wind power would be the cheapest source of energy.